Appliance Warehouse of America, Inc., offers quality, energy-efficient and space saving stackable washer dryer units. Our 24” Thin Twin Stack Set is perfect for your apartment, residential home, condo or loft. Stackable washer and dryer combos are designed to fit in your laundry/utility room, kitchen, bathroom, or closet. With the same great cleaning and fabric care that you expect from a standard machine, our stackable washers and dryers offer convenience and performance. As the nations leading provider of stackable washer and dryer rentals, we are pleased to offer products that fit your lifestyle. We can handle all of your washer and dryer needs! For stackable washer dryer rentals call 1-800-693-4343 or click above to get your stackable set delivered. 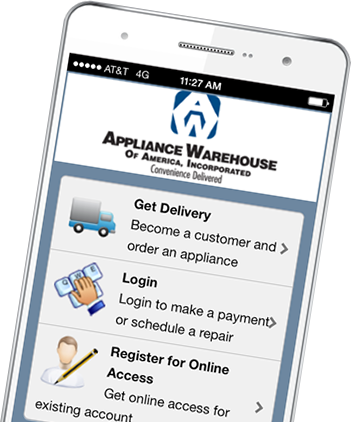 Appliance Warehouse of America is convenience delivered! Smart technology to better serve you. Appliance leasing made easy! Need the convenience of a washer and dryer in your home or apartment? You’ve come to the right place. Our NEW app allows you to log in using our secure portal, pay your bill, and request service from the palm of your hand. Android User? Click here to download the app! iPhone User? Click here to download the app!